U For Change | Donation Call to action for our 2018 Entrepreneurial Program! 20 Dec Donation Call to action for our 2018 Entrepreneurial Program! As 2017 draws to a close, the family here at UforChange is reminiscing on all the hard work we’ve undertaken, and all the work we still have yet to do in 2018. 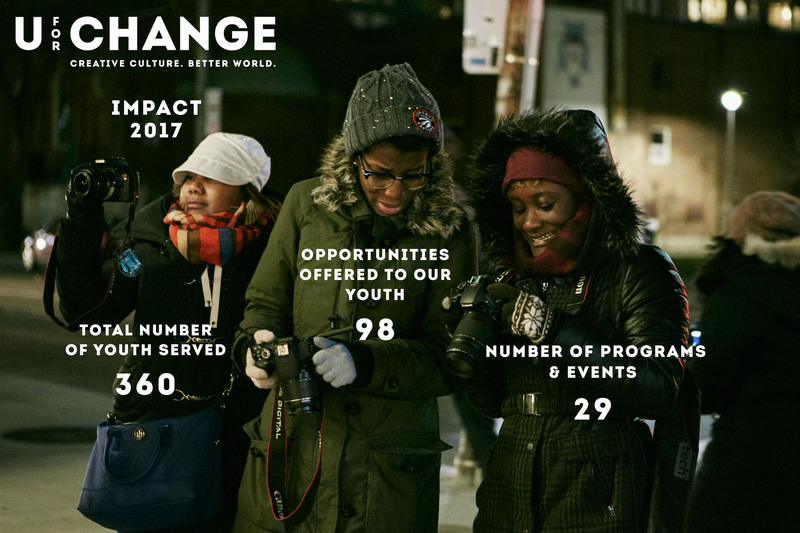 UforChange has served over 300 youth in 2017 through our Core Arts programs (DJ, Fashion, Film and Photography), Workshops in the 6ix and community development partnerships. This includes: Turn it Out, AGO’s Learn to DJ, George Brown’s FX Fashion Exchange program, among others. We’ve had a positive impact on so many youth from all over the Greater Toronto Area, but there is so much more that we can achieve if we continue to work together to achieve the goal of creating a creative culture and better world for our youth in Toronto. We are dedicated as ever to making a greater impact in our young people. In order to carry out our mission, we need your help and financial support to guarantee that this change happens. We hope that you will take a moment now to make a generous year end donation to help us impact over 500 youth in 2018. We know that Toronto is developing and growing at very fast rate. We don’t want our young people to be left without an equal opportunity to be successful in this booming city because they lack the resources to pursue the arts, don’t have the financial support to obtain post-secondary education or lack a mentor who can connect them to their desired industry. Not only does UforChange offer our youth with skills, mentorship and support, UforChange is also a place where youth can express themselves, talk about their personal issues, brainstorm to create innovative ideas and break the barriers that are preventing them to have a successful future. We can only achieve this success thanks to the generous support of donors like you. Your donation will also help UforChange introduce our new ‘Be Your Boss’ entrepreneurship program that we have been raising funds for since August 2017. Currently, our youth do not know how to start or manage their business and for this reason they are often offered rates that are minimum wage for their artistic services. This program will help them understand how to operate their business in their preferred industry and not letting our young people live above the poverty line. Our greatest goal is for our youth to feel encouraged that they can succeed in the arts sector. Our partners, Business in the Streets has been running entrepreneurship programs for youth throughout the Greater Toronto Area for five years. This eight week program will allow 20 alumni who are ready to freelance and start their own business to take this next step in their goal to have a successful business. The program will introduce 6 new mentors that will teach our youth how to brand themselves, how much to charge for their services and how to plan for success. At the end of ‘Be Your Boss’ youth will receive a certificate which can be used in their portfolio as a proud achievement. Every dollar helps us in our mission to ensure each young person has a future rich with opportunity. Please donate as generously as you can, with your support we can continue to make an impact. Thank you and happy holidays to you and your family, and we wish you a happy, healthy, and prosperous 2018!